Seems to be an excessive focus on food in this blog... oh well! With apologies to the vegos, this was a damn fine feast. 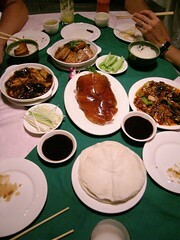 Where better to enjoy Beijing duck than in its spiritual home? Mind you, Chatswood BBQ kitchen compared pretty well. The rest of the dishes are all vegie, and rather good too.